I’ve been brewing on a writing topic for weeks now: shame. But I’m not quite ready to unleash all of the thoughts I have swirling about this insidious emotion. Hence the Part I…from today’s thoughts will eventually come a Part II: Shame. I work at a bakery. 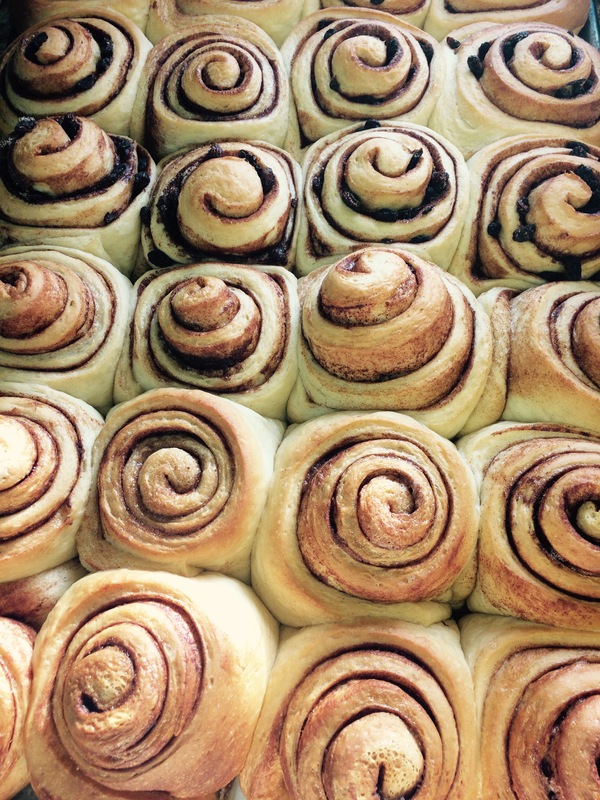 A bakery that makes cookies, cakes, cinnamon rolls, scones, muffins, and brownies. I know that for some sugar is one of life’s greatest temptations. Temptation: something that causes a strong urge or desire to have or do something and especially something that is bad, wrong, or unwise. I send prayers to my teeth at work. I indulge in treats far more often than I would if I wasn’t swimming in cookie dough. And my indulgence takes many forms. Sometimes I wait for one of the girls to gently lift out a cinnamon roll from the tray so I can pounce and eat the scraps with extra frosting. Sometimes I eat a quarter piece of four different cookies, which actually equals a whole cookie. I eat M&M’s now, you know, those candies that the children of Ashland will never experience. When I’m on the bread train I am in the corner near the oven; that’s my little warm home back there. To my right is the baker’s rack with sheets of all the goodies and proofing breads. To the rack’s right is a shelf with a little dish and in that dish lives cookies that broke, brownies that are a day too old to sell, scones that are too small or misshapen, cake slices that crumbled when frosted, etcetera. That is the vortex of temptation. I imagine that customers view the real VOT as the display trays that greet them when they brave the window, but really, the VOT that resides in my corner is the true black hole of desire. I don’t have to pay for the treats in my VOT. There isn’t a sweet counter girl waiting and watching for you to make a decision, nor are there customers waiting behind you, watching what illicit delights you walk back to your car with. I can munch happily all day if I want and the corner VOT will keep refilling with sugar we can’t sell. It helps me to make this all funny. What baffles me still is that I KNOW sugar is bad for my teeth and my body. I know it’s not nourishing, I know I get sugar crashes, I know my dentist won’t have to ask where I work next time I pay him a visit. Is this just deep human nature? To continually convince ourselves to make unwise decisions in spite of “all we’ve learned”? In spite of all the times in the past we’ve confronted this same decision? It is funny though, isn’t it? This human “flaw” that we have wired into our brains? Can we laugh about it? Let the record show I think sugar and treats and desserts are wonderful ways to indulge and give ourselves pleasure and celebrate with our loved ones and communities. I don’t come with advice to offer. I come to show my own humanness and vulnerability. I want to laugh at this conundrum with all those who engage in activities and make decisions against our best interests, day in day out, forever, until we breathe our last and our beloved family and friends are eating frosted cake at our celebrations of life. I hope someone makes carrot cake for mine. I hope that no one feels ashamed. Enjoyed this post again from when I worked at a bakery a few years ago.